Chris Gayle sent out a stern warning to the rest of the playing field with a blazing unbeaten 92 that flattened the already demoralised Chittagong Vikings. 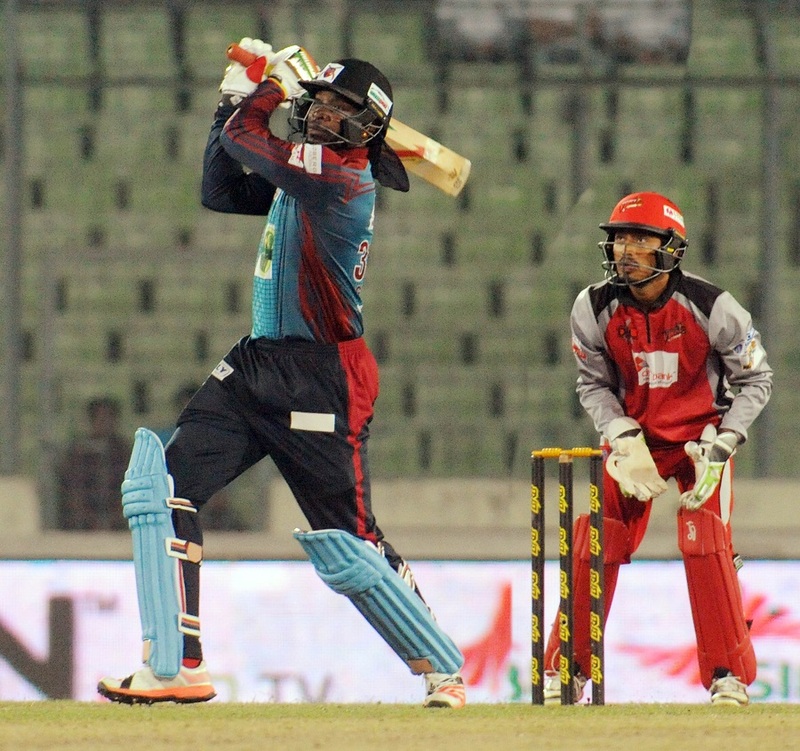 The eight-wicket win consolidated Barisal's position in the top half of the BPL standings as they moved to 12 points. Gayle struck nine sixes and six fours in his unbeaten 47-ball knock. But the big hitting was triggered by Mehedi Maruf, who slammed Bilawal Bhatti, before the Jamaican took over by slamming Maruf for 18 in the fifth over of the innings. There was more carnage as Gayle slammed Asif Ahmed for 19 courtesy three fours and a straight six. The six-hitting spree didn't stop there as Naeem Islam and Tillakaratne Dilshan also came under fire, as Gayle brought up his 53rd T20 half-century in just the 13th over to put Barisal in cruise control mode. From there on, it was simply one-way traffic. With 21 needed to win, Gayle struck Jeevan Mendis for four sixes over long-on to end the game within the bat of an eyelid. However, there was controversy in the first over of the Barisal chase when Dilshan bumped into Rony Talukdar, who was trying to take a quick single. The collision meant Talukdar was well short of the crease when Dilshan picked up the ball and threw it to the wicketkeeper Anamul Haque, who removed the bails instantly. Both Talukdar and Gayle discussed the matter with the umpires but ultimately it was given adjudged run out. Earlier in the day, there wasn't much drama, but there was inconsistency that has hampered Chittagong time and again this season. Their makeshift captain Dilshan had a new opening partner in Anamul for the first time in the tournament after Tamim Iqbal pulled out due to a groin niggle. They put on 52 for the first wicket before Dilshan fell. His 22-ball 28 was courtesy ith two fours and two sixes, which he hit in the same Al-Amin Hossain over. Anamul also struck two fours before Sohag Gazi, playing in his first BPL match this season, had him bowled. The offspinner finished a fine four-over spell in which he conceded only 17 runs. Kevon Cooper had Yasir Ali caught at point in the tenth over before Mendis got into a tangle trying to play a reverse-sweep and was given out. Mohammad Sami then got into the act, first dismissing Umar Akmal after being hit for a six, and then Asif Ahmed in the last over. On both occasions, the batsmen had just changed their bat before the delivery. As far as these performances were handy in restricting the final total, none of it could match the might of Gayle on the night.